After the creation of the BMW M Performance exhaust for the BMW F30 328i, BMW in Germany went to work on an Exhaust for the BMW F30 328i. And now it is finally available!!! It made of high quality stainless steel in Germany using a state-of-the-art CAD and FEM technology. 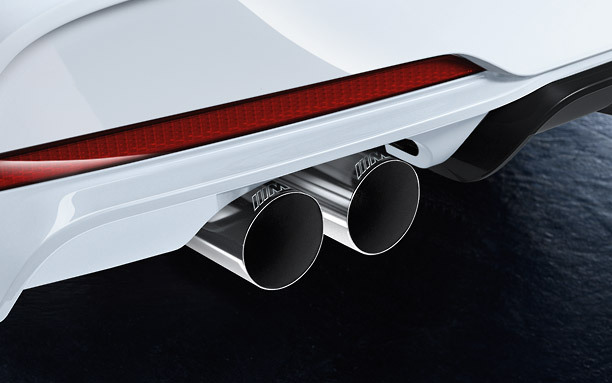 This system produces the most exotic sound by enhancing the natural sound of the BMW turbocharged four-cylinder engine. The tips give your F30 328i a classic and aggressive look with two chrome-plated exhaust tips which are laser-engraved with the M logo. Don't wait to get your hands on one of the first BMW Performance exhausts for your BMW F30 328i. This BMW Performance exhaust has been designed to work with your BMW's factory system. It adds a deep, yet pleasant exhaust sound while retaining your factory warranty. Most importantly, installation of this system does not require modification of the existing exhaust. A BMW factory exhaust clamp is included to mount to the factory cat section. The MPE is an amazing exhaust if you're looking for something that's not too loud. The crackles and burbles will add a smile to your face every time! Great exhaust that a lot of F30 owners have. Got a good price for exhaust + installation, couldn't be happier.